Many pilots think that all paramotors are the same, and that the only difference is slightly different styling. Some will choose a paramotor based purely on its looks, or its power output. But there's actually a lot more to consider when buying a paramotor. Choosing the right paramotor can be a tricky process, but it's worth taking your time and doing some research. If you get it right, you'll have a paramotor that you won't outgrow, and one that will last you many years. When you're ready to choose a paramotor, your final decision should be based on all of the points below. We'll go through each one in this article, but you should also think of your future goals as a paramotorist. Pilots can progress really fast, and the things that they want straight after training will quickly change. Think about what type of flying appeals most to you. Consider how much thrust you will need. Do you need electric or manual start? Find out the weight of the paramotor. Look at how strong the frame is, and how easy it will be to fix. Can you buy replacement parts from the manufacturer? What hook in system do you require? Are you looking for a clutched or a non clutched motor? How transportable is the paramotor? Does the manufacturer offer good after sales and customer service? There are lots of different things you can do on paramotor, but most people will have their sights set on one particular type of flying. You'll probably try all of them at some point, but there will be one that you enjoy the most. If you're a beginner that's never flown, then this could be a hard decision. It's quite hard to know which style you'll end up enjoying the most, this is a good reason to leave your purchase until after your training. Most pilots enjoy a good cross country flight and exploring new areas. You could get together with other pilots, and fly off for hours taking epic videos and photos along the way. If you're like me, you'll enjoy parking your brakes and weight shifting on longer flights. So you'll want a paramotor with good weight shift abilities, more on weight shift later. Thinking ahead to the future, you'll probably want a faster wing so you can fly further, and get there quicker. In this case, you'll need an engine with a bit of grunt. Faster wings will very often create less lift, add full trim or speedbar and the glide ratio is even worse. So you'll need a powerful engine to maintain your altitude throughout the flight. You should also choose a paramotor with good fuel tank capacity, so you have plenty of fuel for long flights. If you fancy getting upside down on your paramotor, you might want to try acro. Acro pilots will also need a paramotor with good weight shift abilities to let them lean into manoeuvres. You'll want something you can easily throw around, so the lighter the paramotor the better. You may want to think about the weight of the engine too. Many pilots choose a top 80 engine as they are super light. But some acro pilots would rather a powerful engine, that can climb back to altitude quickly for the next manoeuvre. But to add power, you'll need a bigger, more weighty engine, so this one comes down to personal preference. Thermalling is not something you'll be doing until you have many hours of flying behind you. If you do choose this route, you will also require a very light paramotor. Whilst thermalling you will turn off the engine and rely purely on the rising air to climb to high altitudes. If you choose a paramotor with a non clutched engine, the propeller won't be able to spin while the engine isn't running. So non clutched engines are preferred, as a clutched motor's propeller can continue to rotate, which will cause extra drag. You'll also want to choose a paramotor with good weight shift abilities so you can easily turn into the thermals. Low level flying is super fun, but you won't be doing much in your first couple of months flying. When you've gained some experience and feel confident enough to fly low, there's a few things to consider. You'll need a powerful engine to climb fast to avoid obstacles like power lines and trees. There's always the possibility of the engine cutting out. You won't have time to find the pull chord, and pull it, so consider an electric start. Pylon racing involves a course of air inflated pylons, that pilots must manoeuvre around in the quickest time possible. Competition pilots will require a very powerful engine to push them around the pylons, whilst maintaining altitude. Pilots will make the wing fly as slowly as possible, and let the engine push their body around the pylon while in a steep turn. 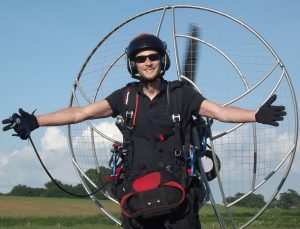 Pylon racers will also need to choose a paramotor with good weight shift abilities to lean into the tight turns. Fun flying is all about a bit of low level, hedge hopping, and foot dragging. You'll enjoy climbing to 5000 ft, and pulling wing overs all the way back down. You'll fly off on the odd cross country flight, while playing around and having loads of fun! For fun flying you'll want a good all-rounder, a powerful engine, good weight shift abilities, and good fuel tank capacity. Think about your body-weight, and how much engine power and thrust you will need to lift you off the ground. You need to get this right, or you simply won't be able to launch. You also need to consider the climb rate you will be able to achieve. If you are too heavy for your chosen engine, you won't have time to climb to avoid obstacles. Lastly, you'll also need enough power to be able to achieve level flight while the wing is trimmed out. If you don't have enough power to maintain level flight at full trim then your top speeds will suffer. Lighter pilots will normally choose a smaller and lighter engine, like the TOP 80, or the EOS 100. Heavy pilots will require a bigger engine like the Moster 185, or the Thor 200. But remember, the bigger the engine, the more weight you will have to carry on your back during launching and landing. Take a look at the top 5 engine choices HERE. The size of the propeller will also make a difference to how much thrust the engine supplies. You'll be surprised at how much difference a 130 cm prop makes compared to a 125 cm prop. The propeller can also make a difference to your fuel economy, a bigger prop will usually give slightly better results. Because of the extra thrust produced, you will use slightly less throttle, meaning less fuel is used. Slightly less throttle also means slightly less torque effect is produced on your paramotor, which is good. So overall, the bigger propeller is better. Do your engine research, and think about reliability, and the availability of spare parts before buying. Take your time, and choose right to avoid buying twice like I had to! This choice may depend entirely on the style of flying you chose earlier. For example, thermalling will require the engine to be switched off for long periods. When engines cool down they become harder to start and may require choke. The choke is normally pulled before starting, or some engines have a priming bulb that you squeeze. This cannot be done whilst strapped into the harness, or mid flight, so electric start will be preferred. But remember, if you choose a paramotor with electric start, this will also add some extra weight. Not much, maybe one to two kg, but this can make a big difference on a fuel laden paramotor. When choosing a paramotor, think about the weight of the whole unit, including your chosen engine. You will have to run with this weight on takeoff, and hold the weight up during landings. If your legs give way you could cause some serious damage to the paramotor, and to yourself! Think about how much weight you can carry. Do you have back or knee problems? And don't forget the weight increases as you add fuel to the paramotor. Can you lift a fully fuelled paramotor from the sitting position on the ground? You'll be surprised at what a difference a few extra litres of fuel will make. 1 litre of fuel weighs about 770 grams, so a fully fuelled paramotor with a 14 litre tank, will weigh nearly 11 KG more than dry! If you already have a heavy paramotor, you will need some strong legs too! And Remember to include all of your extras when working out the weight. So include the reserve chute, helmet, a full tank of fuel, etc. Also include your wings stuff sack, I advise carrying this under your seat in case you have to land out. Frame strength is important, especially for beginner paramotorists who may have a few bum landings to begin with. You don't want to choose a paramotor that will buckle on your first small fall. Even after six years of flying, I still have the odd bad landing on damp mornings, in slippery fields. This is bound to happen to everybody eventually, so choose wisely. Thin tubular frames may also be a bad idea, because of the stress that they have to endure during takeoff. As you pull the wing into the air for a forward launch, the lines will pull against the cage. This can easily buckle thin tubing used on cheaply built paramotors. Also consider repairs that you may have to do; if you do break a frame section, can you repair it? Does the manufacturer offer replacements? Things like nylon inserts that connect frame sections, and special clips may eventually break, or you could loose them. Find out if the manufacturer can send out replacements, as getting these specially made could cost you a lot. Many manufacturers are now making aerodynamic frames, these frames are shaped like an aerofoil for less drag. The picture above is the frame of my Parajet, Scout are also using this design. You may also find streamline fuel tanks, and thinner netting to further reduce drag. When I'm flying under power, I generally find myself flying slightly in front of my wing. The wing will not fly any faster, so the aerodynamics of the paramotor makes little to no difference. But when gliding with the engine switched off, you may find that it makes some difference. But to get the most out of it you'll have to tuck your legs and elbows like cyclists do. This may appeal to cross country pilots, and those searching out thermals. It may even make a difference for acro pilots and pylon racers, so bare this in mind when you choose a paramotor. Something else that's getting popular in paramotor aerodynamics is anti torque lamells. These are placed on the netting, and are designed to counter act the torque effect. They basically use aerodynamic surfaces, to produce forces similar to the torque of the motor, but in the opposite direction. These can be added after purchase and fit most paramotor netting. Next, you will need to choose your preferred hook-in system. You can choose between high, low, and medium hang points. My current Parajet volution 3, and my old Parajet Zenith pictured above, both use medium height hang points, and gooseneck bars. This puts the carabiners level with the thrust line, which prevents power induced pitch movements. Another option is high hang points, these are favoured for their comfort, but they have some disadvantages. They allow little or no weight shift, meaning you'll have to use your brakes or tip steering for corrections. And, if you watch pilots with high hang points, you'll very often see the paramotor flying sideways below the wing. This is because high hang points can also accentuate torque twist. Most modern paramotors will have moving bars or spreaders, but you may still find paramotors with fixed bars. These will also prevent, or lessen weight shift abilities. Low hang point paramotors can increase power-induced pitch behaviour. When pilots go to full power, the thrust can push the pilot over the hang point. 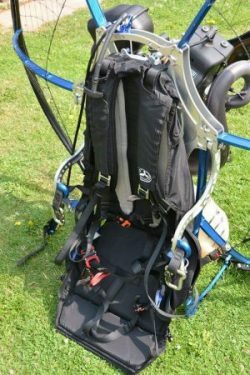 The pilot and paramotor will pitch forwards, this decreases thrust efficiency, and quickly gets very uncomfortable. Cross country pilots may prefer high hang points for comfort, but they'll loose weight shift abilities. For everything else, I'd recommend that you choose a paramotor with medium hang points with moving gooseneck bars. These are certainly the most popular choice amongst paramotorists, and are offered by many manufacturers. Now it's time to decide whether you would like a clutched or non clutched engine. 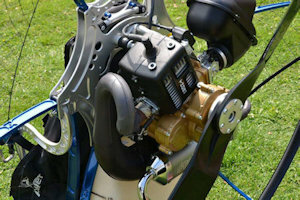 A non clutched propeller will start to spin as soon as the engine is started; the more you rev it, the faster it spins. The only way to stop it, is to turn off the engine. When the engine is switched off, the propeller will not turn without being forced around by hand. When the engine is not running, turning the propeller by hand will turn the engine over. To do this, you should remove the spark plug cap, and turn the switch to off, to prevent the motor firing up. As we mentioned earlier, pilots that enjoy thermalling should consider a motor without a clutch. This is because of the drag that a spinning propeller creates. Non-clutched motors can also be safer during landing, as the propeller stops instantly when you cut the motor before touchdown. If your wing falls down on top of the cage, there's no chance of the propeller shredding your wing, or its lines. But you'll need to be careful during takeoff, the constantly rotating propeller can catch in lines as you clip-in. You'd normally warm the motor up away from the wing, and start the motor after clipping in. A failed launch where the wing falls onto the cage, could also shred your wing if the engine isn't stopped in time. If you feel a launch going wrong, you'll have to be quick with the stop button. A clutched propeller will not spin when the engine is idling. As you add power the clutch will bite, and the propeller will begin to rotate. The power delivery will be slightly slower, but also less aggressive. You can start your motor before you clip in, but if you rev the motor, the propeller will take a few seconds to stop spinning. So if you do this whilst clipping in, you still risk catching the lines. And, if you rev the motor before running on launch, you will still risk shredding the wing. You'll also have to stop the motor in good time before touchdown, to give the propeller time to stop spinning. If the propeller is still spinning after you land, you will risk the wing falling onto it and being destroyed. A clutched motor could be a good idea if you trip up a lot, as it could save your cage and propeller. When the cage flexes as you hit the ground, a constantly spinning propeller could easily touch it and damage both. This is another good reason to choose a paramotor with a strong frame and cage. 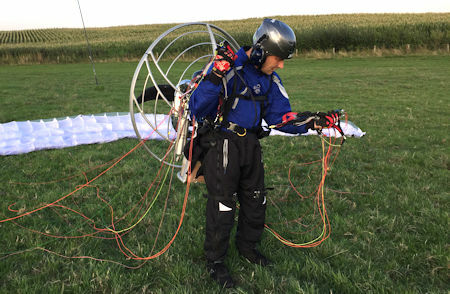 You'll need a paramotor that you can easily transport to and from the launch site. If you need to fit it into a small car, or average sized van, you'll need removable cage sections. So look for a paramotor with cage sections that clip together fast and easily. If you don't want to put an oily paramotor into your nice clean car, you could use a carry rack. This is something I use when I travel with my paramotor, and need the extra boot space for other things. To see which rack I use CLICK HERE. These carry racks are also great for paramotors that don't have removable cages, or ones that take a long time to assemble. There are some really good paramotor manufacturers out there, but also some bad ones. I won't mention names, but I know of manufacturers that quickly sell and dispatch paramotors, but if you need parts or service, they aren't interested. It can be quite hard to find decent, unbiased paramotor reviews online, but social media can help a lot. Join groups and forums, and ask questions before you choose a paramotor manufacturer. Ask questions about customer service and warranty. Are they easy to contact via phone or email? Can they get spare parts to you quickly? Etc. This might seem like a hassle, but you're about to give a lot of money to them, the least they can do is offer good after sales service. You're ready to choose a paramotor! You now know exactly how to get the best paramotor for your money. Do everything mentioned in this article, and you will get an excellent machine perfectly suited to you; that will last you many years. Take your time on each step, and don't rush into it and make mistakes like I did as a beginner. If you're on a tight budget, you can check out my guide to flying on a budget HERE. Good luck with your choice! A paramotor carry rack that's super strong, and fits on the tow bar of your vehicle > HERE. Find out whether paramotoring is really safe, and some tips to help you out > HERE. Other ways to transport your paramotoring equipment > HERE. 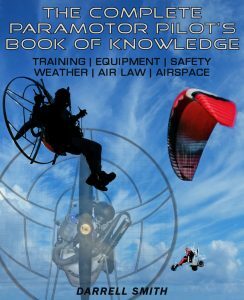 And how to enter the wonderful world of paramotoring > HERE. Although I’m not going to be able to start paramotor training for another 2 years the information on this website has been so invaluable, as a complete novice I feel so much more confident looking for a paramotor that will suit me, all I can say is a massive thank you Darrell for taking time to put into print all this information, thank god for people like you who put time aside to help others. Thanks for the kind words Sean, I’m really glad the posts are helping you. Good luck with your journey into paramotoring, see you in the air in 2 years! Just casually interested in pg so google brought me to your volition 3 review. That was an interesting read and a link there brought me here. I found lots of good info and plenty of food for thought, in a very well presented format. I would say that it’s a great article that is well thought out and a good resource for novice fliers. Thanks for the nice feedback Paul. I’m glad I was able to help you! Awesome site and info thanks a bunch. I enjoyed reading your site as I consider which motor to purchase and what I need in way of power and dependability. It has helped me narrow down my choices and even saved me from buying a trike and wing which would have been to under powered for me. As a newby in the sport I try and read as much as I can before I make a large investment in equipment . A well written and well put together site….THanks very much for the effort.